Speaking Wednesday at the St. Anthony Shelter for Renewal on East 156th Street, de Blasio and Dolan said the effort was in line with Pope Francis' teachings. 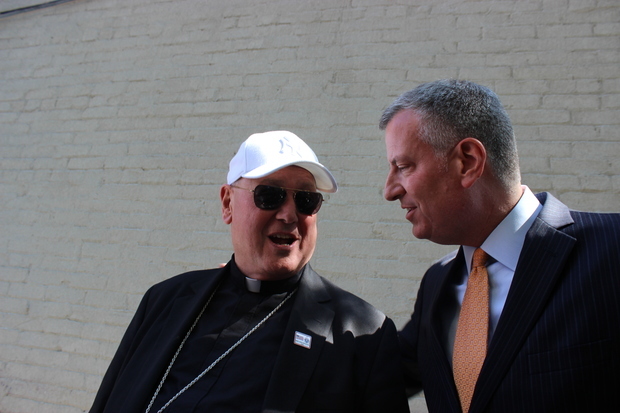 "We are amplifying the pope's agenda," de Blasio said. "We are answering his call to action." The initiative, called "Opening Doors," comes in the wake of criticism de Blasio has faced about the more visible homeless population and homeless encampments. De Blasio's deputy mayor overseeing homelessness, the highly regarded Lilliam Barrios-Paoli, also recently resigned to take an unpaid position. At first, the mayor played down the extent of homelessness in the city before admitting that it was an issue. De Blasio has since rolled out a series of initiatives to address the problem and has added $1 billion over four years to the city's homelessness budget. "The problem is not a new one. For decades we've had a profound challenge with homelessness," said de Blasio. "But what is new is the huge weight of the economic reality we face today and what that is doing to change homelessness as we know it." He also urged New Yorkers to follow Francis' example and not "denigrate" or "minimize" the homeless. "His Holiness reminds us of our common humanity and he instructs us to think of people who don't have a home first as human beings, not as faceless burdens on the society," said de Blasio. "Homelessness is something that could happen to anyone." The effort comes after months of conversations with religious leaders, say city officials. The archdiocese will provide 150 beds. Other faith-based providers will have anywhere from 10 to 19 beds and will commit to providing a meal. Department of Homeless Services Commissioner Gilbert Taylor said that the city is still identifying faith-based partners to provide the remaining 50 beds. The beds will also come with access to social services and some sites will remain open during the day to provide those services. With cold weather on the horizon, the goal is to have some of the beds up and running in the next few weeks, Taylor said. The 500 beds are part of the city's "Safe Haven" plan to attract people who are afraid or unwilling to enter the city's traditional shelter system. "What we have found from real experience is that a smaller, more intimate, more supportive setting will actually draw people off the street and to where they can get help," said the mayor. Taylor said the work then begins to draw those people into programs that can help them transition into more permanent housing. At St. Anthony Shelter for Renewal, about 35 men at a time are committed to a bed for at least six months, said Rev. Herald Brock. The time gives the men a chance to decompress from living on the streets and for relationships and friendships to develop. "That's what allows walls of defenses to go down and trust to emerge," Brock said. "We want to be able to give somebody a substantial opportunity to be able to have a spring board to something new."